is quite a machine. It has a large throat space which is great for home machine-quilting frames. It’s an electronic sewing machine for piecing quilts, with 135 stitches and two alphabets. It’s a professional-grade sewing machine with the “oomph” to handle heavy work, all day long. But can one machine be all things to all people? Did Janome have to make compromises to make the MC6500P good at so many things? Those are the questions I set out to answer. The Janome 6500P has a harp (the area under the arm) that is 9″ wide and 5″ tall – noticeably bigger than your average sewing machine. It gives you a ton of room to work with. Stitching speeds of up to 1,000 stitches per minute mean you can breeze through projects. However, the control and accuracy is what’s important for machine quilting, so most machine quilters don’t run their machine at full speed anyway. Thankfully this machine is perfect in both areas. In addition to the extra room on the bed, the Janome Memory Craft 6500 also has extra room on the thread spindles, and a pop-up thread guide like that of a serger. There is enough room to put two large cones of thread side by side. I kept a cone of polyester on one spindle and a cone of rayon on the other to make it easy to do embellishing stitches and machine quilting. When I switched from cone thread to spool thread, I continued to use the thread guides instead of any of the four spool caps (two small, two large) that come with the machine. I didn’t have any trouble using any size spool, from the large cones to the tiniest spool I have, which is about half the size of a Sulky metallic spool. The MC6500P doesn’t have a horizontal spool pin, but I never missed it. I also liked the built-in thread cutter. You can press a button on the front of the machine to cut your thread, or you can store a thread-cut action in any sequence of stitches in memory. By storing it in memory, you don’t have to remember to push the button to cut the thread. Another really nice feature of the Janome Memory Craft 6500P is its independent bobbin winding. I started the bobbin winding, then went about my work at the machine, quilting or sewing while the bobbin winder filled a bobbin. But for a sewing machine that will do a lot of machine quilting, I think Janome could have picked a better bobbin system. Like other Janomes, the MC6500P uses a drop-in rotary hook bobbin that produces nice stitches. But changing a drop-in bobbin isn’t very convenient when the sewing machine is installed in a frame and covered by a quilt. Janome also didn’t include a “bobbin empty” light or bell on the MC6500P. However, the bobbin compartment has a clear cover so you can easily peek in to see if the thread is getting low. But that probably not going to be very help if you’re machine quilting with a frame. The MC6500P’s presser foot pressure adjustment is an easy-to-read indicator with a large screw-type adjustment. I really like having it so prominent. The knob allowed me to position the pressure anywhere on the scale of 0 to 3. I reduce the pressure when I’m using feather, blanket, or other edge-decorating stitches to make it easier to guide the fabric under the foot. The MC6500P has a sliding speed button to set the maximum speed at full throttle, but you have to use the foot pedal to run the machine. I found that the maximum-speed sensor wasn’t very sensitive at a very low setting. So I moved it beyond the maximum speed I really wanted, then brought it back. That seemed to help. I think the Janome Memory Craft 6500P needs a start/stop button in addition to the foot pedal. This would be especially handy when using a machine-quilting frame. The MC6500P has a lot of really nice features for machine-quilting, but what really sets it apart from other large-harp sewing machines is that it does much more than just straight stitching, making it good for both piecing and machine quilting (on a frame, or off). In fact, one of my favorite things about the Janome Memory Craft 6500 is the number of options for each stitch. For example, the hand-look quilting stitch gives you a choice of several different styles from which to choose. Each style has a different number of forward/backward stitches interspersed between advancing stitches, so you can get just the look you want. The MC6500P’s screen tells you the range of tensions that will give you the best look for each stitch. In testing the hand-look quilting stitch, I chose the highest tension in that range, since a hand-look quilting stitch uses a tight tension to pull the bobbin thread to the top. I was really pleased with my first choice. I didn’t have to do a lot of adjusting and trying different combinations to get a good hand-look quilting stitch. Other than for the hand-look quilting stitch, I never had to move the tension adjustment off the #4 position. The MC6500p handled all kinds of thread and thread combinations, fabric combinations, and different stitches without any tension adjustments. Of the MC6500P’s 135 stitches, I really like the French Knot stitch, which will come in handy for redwork and for embellishing. The feather stitches come with several different looks, changing direction and origin and termination of the feathers. I like the array for crazy quilting so all the pieces don’t look exactly alike. The blanket stitches give you choices that will look good on all kinds of fabric. The heavier ones look real nice on wool or felt applique, and the lighter ones look great on cotton applique The length and width of all these stitches can be modified to many sizes for any kind of look you want. 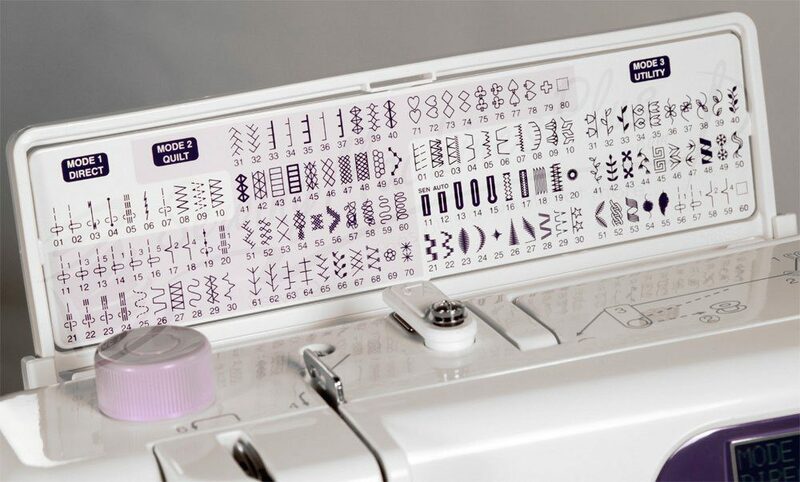 The Janome MC6500P also has two stitched American alphabets and two stitched European alphabets with accent marks. One of each alphabet is block style and the other is script. Each alphabet includes upper- and lower-case letters, several sizes of spaces, and some special characters. The letters can be printed in two sizes – 5mm and 7mm. Unfortunately, none of the alphabets include the @ sign, so you won’t be able to put your e-mail address on your quilt labels. Yes, you can have an e-mail address that will never change, so you can put it on quilt labels. 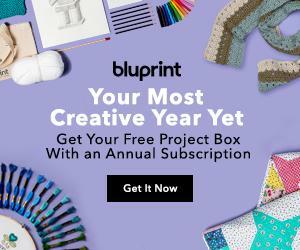 Learn more about a “LovesToQuilt.com” permanent e-mail address. The MC6500P has several utility stitches and 60 decorative stitches including designs, buttonholes, and satin stitches. This machine includes Janome’s easy sensor-foot buttonholes and makes automatic buttonholes and manual ones for large decorative buttons. There are seven types of buttonholes in all. For even more flexibility, the MC6500P has a TOM (“Turn Over Memory”) button. This allows design stitches to be flipped side to side, but not end over end. I find I use the side-to-side flip most often in my sewing anyway. The MC6500P has a built-in needle threader, and it comes with an extension table. I like the large work surface level with the bed of the machine that the extension table provides. I change my sewing machine feet almost as often as my thread, so I use the space under the table as a place to put the accessory box, keeping the extra feet close at hand for quick changes. Since the bobbin drops in from the top, I don’t’ have to worry about having to move things out from under the table to access the bobbin. The MC6500P comes with 14 feet, including a 1/4″ piecing foot, an open-toe walking foot, an open-toe foot for applique, and a horseshoe-shaped darning/quilting foot. I tested all these feet, and more. All worked well. I was impressed to see that the left side of the MC6500P’s needle plate has markings for 45, 60, 90, and 120 degrees. This is used like Pam Bono’s Angler 2 for lining up the edge of a square so you can sew perfect angles to create triangles. The MC6500P has the feed-dog drop button right on the front of the machine where it is easy to access. This is much better than having to take off the extension table to get at a button in the back of the machine. The MC6500P also has a knee-lifter for lifting the presser foot without having to take your hands off your fabric. The most obvious characteristics of this professional sewing machine are the size and weight. The MC6500P’s metal base makes the machine heavy-duty (and heavy! ), so it can sew at top speed without any vibration. It sews 1,000 straight stitches per minute, and 700 zigzag. While most quilters don’t sew at this speed very often, the long, straight seams of home decorating sewing are much less tedious with a high-speed machine. And because the Janome Memory Craft 6500 is a heavy-duty sewing machine, it easily handles many layers of heavy fabric. I found that the metal base isn’t as slippery as the plastic bed on my Janome MC3000. This seems to cause a very minor drag on the fabric. A little silicone on the machine bed should eliminate the drag. One thing I should note is that the Janome MC6500P comes with a dust cover, but no hard case. I think I’d get more use out of a dust cover, anyway. It’s easy to put on and take off and store, taking up less room than a hard case. The MC6500P also has a black button on the straight stitch/zigzag foot that locks the foot in a horizontal position, keeping the foot from dipping down to ride on the fabric. This feature eliminates the thick piece of plastic needed to lift the foot to get it to sew properly over uneven thicknesses. The Janome MC6500P also comes with a cloth guide that screws into the bed of the machine. It is a T-shaped bar with a slot cut in the “stem” of the T so you can position the crossbar of the T whatever distance you want from the needle. The crossbar lines up with the seam sizes printed on the right side of the needle plate. These marks include the usual seam sizes for sewing, like 1/2″ for home decorator sewing and 5/8″ for garments (which is fine, though the MC6500P doesn’t have a free-arm, so it’s not an ideal garment sewing machine). You won’t find a 1/4″ mark, however, because the feed dogs are so wide that there’s no place to put one. I like having a cloth guide for some kinds of sewing. I always use a cloth guide when I’m doing long seams, like those on upholstery or the side seams of a dress. I find it easier to run the cloth against the guide than to watch it go past a mark on the machine bed. I love the speed and power of the Janome Memory Craft 6500, and I love not having sacrificed the flexibility and intelligence of a good electronic sewing machine to get the speed and power. I like the choices and options for all the stitches. And I like the fact that it’s not picky about thread so all my stitches came out right the first time. If you plan to machine quilt lots of wall hangings, this is a great choice of sewing machine because of the extra room on the bed. If you plan to do lots of bed quilts, use the MC6500P on a home machine-quilting system to get more quilting room than a typical beginner sewing machine would give you. 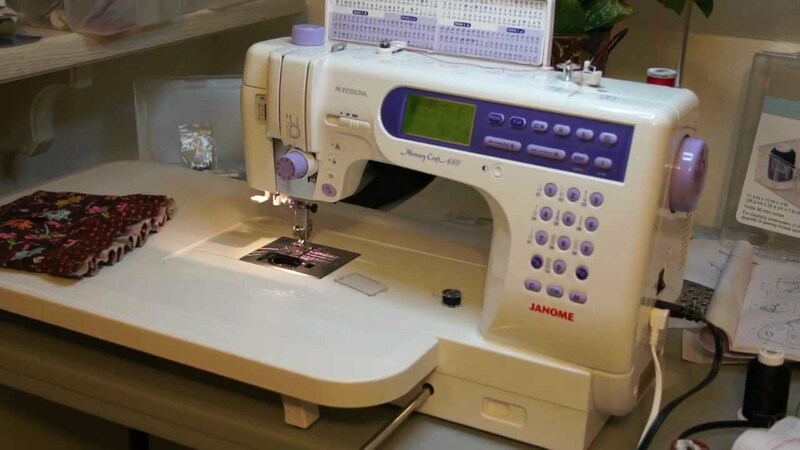 And if you like to decorate your home, this sewing machine is a very good choice for drapes and upholstery because it sews fast and handles heavy fabrics well. There is a lot to love with the Janome Memory Craft 6500. Speed, power, reliability, features, and much more. If you quilt and also want to sew garments, etc. then this is a perfect sewing machine for you. I had a lot of fun using it and I’m sure that you will be completely satisfied with it too. What a great review! Very thorough and honest. I just purchased this machine and look forward to using it! You have given me confidence in my purchase!